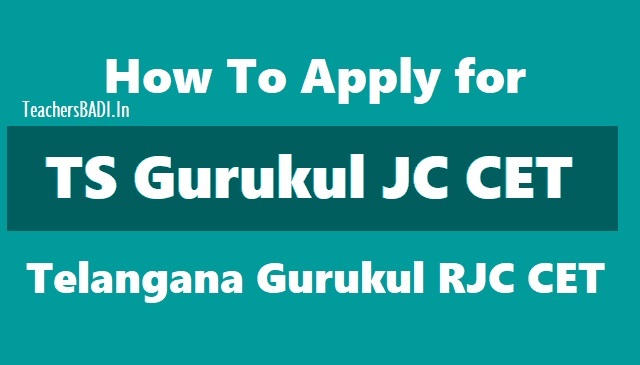 How to Apply for TS Gurukuk JC CET 2019 -Telangana Gurukul RJC CET: Candidates seeking admission into Intermediate I year have to apply only for one Society i.e. either to TSWREI Society (OR) TTWREI Society Junior Colleges for the academic year 2019-20 for GURUKUL JC CET 2019 through online by visiting www.tswreis.in. TSWREI Society, TTWREI Society have established Residential Junior Colleges with an objective to provide quality education to the talented children. Presently, TSWREI Society is managing 127 Junior Colleges and TTWREI Society is running (49) Junior Colleges during the academic year 2019-19 with MPC, BPC, MEC, CEC, HEC and Vocational Courses. i. The candidate shall first go through the information bulletin carefully and satisfy their eligibility for appearing for GURUKUL JC CET 2019.
ii. The candidate after satisfying himself/ herself about the eligibility criteria for the submission of application through online should pay a fee of Rs.100/- through ONLINE or through Credit card (Payment gateway ) from....... for submission of application through Online. vi. Candidate who have appeared for SSC Board Examinations 2019 have to enter the hall ticket Number while filling the online application. Once Hall Ticket number is entered, certain data and photo of the candidate will be captured online. If the Data is not available in SSC Board the remaining data shall be entered by the candidate. In case of CBSE, ICSE candidate, candidates haves to fill the full data as per requirement of application. ix. On submission of application through ONLINE, the candidate has to take a copy (print) of application form in which a reference number is given. This Reference number is required to download the Hall Ticket. The copy of online application is to be preserved for further reference. x. For any mistakes/ incorrect information, the candidate is solely held responsible. Hence, they must take utmost care while filling the online application. xi. The Applications of the ineligible candidates will be summarily rejected. I declare that I have read the Information Bulletin of TSWRJC CET 2019. I am appearing for SSC Public Examinations, March-2019 as a fresh candidate (Not compartmental). Particulars furnished above are true and correct to the best of my knowledge and belief.